Leonard’s father, Abijah, was born in 1851 in Great Marlow, the son of a publican. His mother, Emma Wheeler, was a plumber’s daughter, born in 1849 in Eton. They married in 1874 in Camberwell, London, and had at least eight children, six of whom survived: Frederick Charles born 1876, Edith 1877, Emma 1882, Margaret Alice 1884, Leonard 1888 and Leslie 1891. Frederick was born in Windsor and all his siblings in Eton. In the 1891 census, the Warrells were living at and running a grocer’s shop at 123 Eton High Street and their eldest son Frederick was working as a grocer’s assistant. Edith, Emma and Margaret were all at school and three-year-old Leonard and his nine-month-old brother were still at home. Later that decade the Warrells opened a fishmonger’s shop at 121 High Street which had formerly been a confectioner’s. After Abijah’s death, his wife appears to have kept the family business going. In the 1901 census, Emma, 54, was listed as a fishmonger and poulterer and an employer. Her daughter Emma, 19, a book-keeper, Margaret, 17, Leonard, 13, and Leslie, 10, were with her at Sylvaton. Leonard and his brother Frederick moved to Nottingham. Leonard became a fish salesman, working for Frederick at 97 Willoughby Street, Lenton, Nottingham. Back in Datchet, with just Emma (then a daily governess) and Margaret at home in their nine-room house, Sylvaton, their mother let out spare rooms, advertising ‘apartments’ in Kelly’s Directory. Leonard signed up before the war, on 7 November 1910 in Nottingham, aged 21 years and 9 months. Three days after signing up Leonard had four teeth filled. He was vaccinated on the 15 November and examined for service in India. 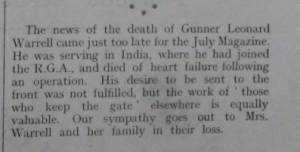 He was posted to 14 Company, Royal Garrison Artillery, as a Gunner on 22 February 1911. In the 1911 census he was at Shoeburyness Barracks. On 2 January 1912, as Gunner 34133, he joined 8th Mountain Battery, Royal Military Artillery, at Quetta, India (now Pakistan). The British Forces in India were made up of units from the British and Indian armies. During the war, these combined forces defended the Indian subcontinent from the threat of Russian invasion. Leonard’s military documents, available on Ancestry, include a character reference from a Mr W Addicott, a grocer of 86 Willoughby Street, (a few doors away from Leonard’s brother’s shop) in Lenton, Nottingham, dated 7 November 1910, which stated Leonard had been working for his brother Frederick as a fish salesman. Mr Addicott described Leonard as sober and honest. There is also a physical description of Leonard in the files: he was 5’8” and weighed just under 10½ stone. His expanded chest measurement was 37” and 34” at rest. He had a fresh complexion, with brown eyes and dark brown hair. He had a mole on his left cheek, and also on his right elbow, right breast and right collar bone. His pulse rate during his medical was 90 beats per minute. The physician recorded that Leonard had good physical development, no small pox marks, and had been vaccinated in infancy. His religion, Church of England, was also recorded. In 1912 Leonard had a bout of pleurisy and spent 39 days in the hospital at Quetta over Christmas. In late May 1915 he was back in hospital, this time in Peshawar, with synovitis of the knee. His swollen knee was massaged to help reduce the build up of fluid but perhaps it didn’t respond to the treatment as hoped and the surgeons decided to operate on 19 June in the station hospital. Leonard died of heart failure following chloroform anaesthetic. A telegram was sent to his mother the same day. Did Leonard have a weak heart or was he incorrectly anaesthetised? According to Ana Carden-Coyne in The Politics of Wounds: Military Patients and Medical Power in the First World War, many medical officers pressed into surgical work had insufficient experience with anaesthetics. Major Hogarth, a GP transferred to the RAMC in June 1915, complained to the 1917 committee in France that during the Loos advance (September 1915), some doctors were ‘useless’ with no knowledge of anaesthetics, operations ‘or anything’. Whether or not this was also the case with the surgeons who operated on Leonard isn’t known, but in More Than Bombs and Bandages: Australian Army Nurses at Work in WWI, the author Kirsty Harris relates a story told by an Australian nurse who described an assistant surgeon in Peshawar as ‘worse than useless’. Leonard had served for four years and 225 days. 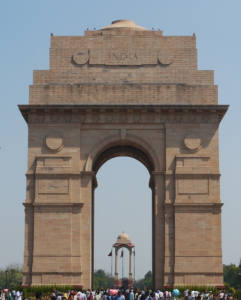 He is remembered on the Delhi Memorial (India Gate). His records on the Commonwealth War Graves Commission website here, explain that his body was moved from its original burial place to Peshawar (now Pakistan), to an established war grave cemeteries where the Commission could ensure proper commemoration. Leonard was awarded the Victory and British War Medals and the 1914-15 Star. His records indicate that a registered parcel was sent to his mother from Peshawar on 4 April 1916, containing personal possessions such as photographs, picture postcards and a Royal Army Temperance Association Medal. His Soldier’s Effects document shows that his mother and siblings each received £5 14s 3d after his death. In 1919, Leonard’s mother was asked to provide information so that the military could send her a plaque and scroll in commemoration of her son. Leonard’s brother Leslie had also fought during the war. 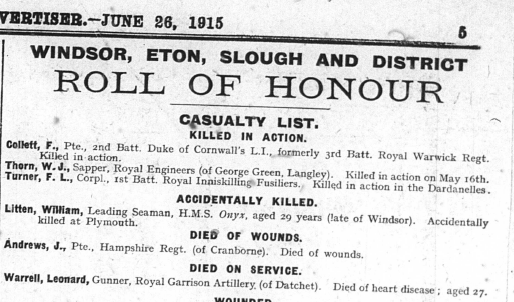 He was listed on the Datchet Roll of Honour in the Windsor & Eton Express of 9 January 1915 so he must have volunteered soon after the war started. He was attached to the 16th Lancers and was wounded on 22 January 1916 but survived. He became an artificial limb fitter; presumably there was quite a demand for his services after the war. He was married in 1921 to Winifred Violet Gaines. Their marriage certificate gives her address as Royal View, Datchet. She was the daughter of Thomas Gaines, Clerk at the Parish Church of St Pancras, London.